Breakfast: the most important meal of the day! Here's how to do it right, from architectural dining nooks to gadgets geared towards making your morning pour as painless as possible. On a shady street just off the main drag of Melbourne, Australia’s hippest inner suburb, a pair of creative types and their two kids have made a bright, cheery home by renovating an 1860s stable. The large, naturally lit kitchen is the heart of the house, and an eat-in bar ensures family together each morning for breakfast. Photo by Stephen Oxenbury. Juice shops are the latest big city fad—you can always find a bottle in the Dwell office—but for those who don’t want to shell out $2 per ounce, consider this Bodum number. The Bistro Citrus Juicer comes in six bright shades and sits higher than most juicers, so its drip-stop keeps the juice from dripping all over your kitchen counter. A cyclone function prevents the pulp from going awry. Made from plastic, silicone, and stainless steel. 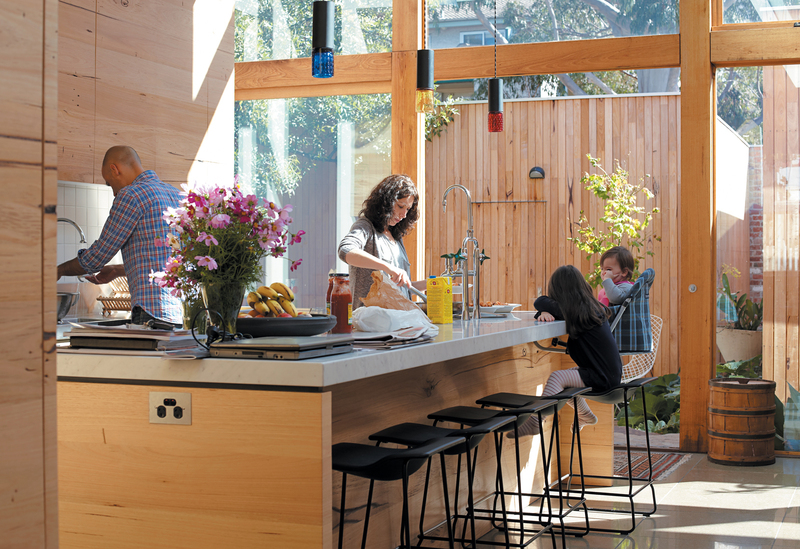 Architect Alex Scott Porter enjoys a sun-filled breakfast at the built-in dining table and bench, one of many space-saving designs she included in the seaside cabin she created for her father in Maine. Photo by Eirik Johnson. More great gadgets to make your breakfast sing, from the world's first see-through toaster to a yogurt maker. For this restaurant-inspired kitchen renovation in San Francisco, breakfast is a French affair. Designer Jeff Sand’s Universal Chairs combine his love for classic Francophile café chairs with an appreciation for “the beautiful metal casings on an old Moto Guzzi.” Photo by Cesar Rubio. Breakfast in bed? You betcha! Brighten up a petit déjeuner with these 12 colorful serving tray options. At breakfast, Chicago homeowner Arthur Jackson multitasks while seated at the dining table. He hand-stenciled the pattern on the wall in the background. Photo by Matthew Williams. One last way to wake up breakfast hour: with a bright red eating surface, like this number by Arik Levy. The table, for Zanotta, sports a bright red plate-glass top with steel tube base kitchen table.